← Come on Ireland – wake up. The Nanny State strikes again. So far we have had to put up with speed limits, safety helmets, seat belts, smoking bans, ban on corporal punishment and loads more. But it’s all for our own good. We have to be protected from ourselves at all costs. Now the EU and the UN have stepped in and are banning slapping for God’s sake. So now we can’t bring up our children without the Nanny State looking over our shoulders. I had the living daylights walloped out of me in school on a regular basis. They even had specially made leather straps for the purpose. We behaved ourselves in class. There was respect for authority. There was no disruption in class. I didn’t grow up to be a child molester, or a serial killer or a thug. Mind you, there’s time yet. I gave our daughter the odd slap in the past. She deserved it. It didn’t do any harm. If she was beyond reasoning, then a slap on the back of the legs worked wonders. In fact after the first couple, the threat was all that was needed. She has grown up to be a [reasonably] well balanced person. We love her and she loves us. And she has no complaints about those slaps [Incidentally, if there is a comment from “Offspring” denying this, then ignore it. “Offspring” is an imposter]. One time recently, my granddaughter started belting my grandson. She is two and he is five. But he is severely handicapped so he can’t fight back. We told her to stop. We tried to distract her. She kept belting him over the head with hard toys. My daughter gave her a slap on the back of the hand. She stopped hitting her brother straight away. Lesson learned. I give Herself the odd wallop with a baseball bat. She likes it. It shows I care. She gets me back with the frying pan when I’m dozing in the armchair. That’s love. If this law comes in and my daughter still wants to slap her children, I’m not going to stop her. It’s her business, not the EUs or the UNs. They can f*ck off as far as I’m concerned. Unless of course they are going to provide individual carers for each and every harassed mother who has a screaming child in the supermarket. You know where this is leading. Don’t you? The next thing is that they will ban smoking in the home. And we won’t be allowed more than one whiskey or one can of Guinness. It will all be for our own good. And we won’t be allowed to fart because it upsets the ozone layer. So to enforce all this anti-smacking, anti-smoking, anti-drinking and anti-farting, they’ll have to install cameras in every room in every house. 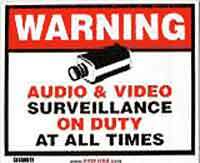 But the peasants have been brainwashed into thinking that spy-cameras are great, because of Big Brother. I forecast the day will come when I reach for a top-up to my drop of whiskey and a voice will boom from the speaker in the ceiling telling me I’ve had enough. Or I raise the leg after a vindaloo to relieve the pressure and I get 10,000 volts up the backside because I’m producing too much methane. When they come to install the cameras, I’ll be there with Herself. We’ll have the baseball bat and the frying pan handy. Hey, you seem a pretty well read person. Ever read 1984 by George Orwell? That’s the book that inspired Big Brother. That’s about a total nanny state gone mad – though I suppose there were no skobies in it. And as for slapping children, I got the odd hit too. Psychological damage my arse. You just interrupted my Googling of Amy Lee!! I was tempted to mention 1984 all right. He had it bang on; just a few years early. A wee drop of physical violence never did anyone any harm. Just ask the lads in Guantanamo. I shall continue to exercise my rights. I may not have young children of my own [my daughter would just hit me back], but it’s not going to stop me taking a swipe at the odd Snot Gobbler that crosses my path. hmmmm i can joke about government interference in people’s lives, but i just can’t find anything funny about domestic violence. i’ve seen its very real, very devastating aftermath too many times in my life. let’s joke about something else…. Woooah – there is a world of difference between a smack on the back of a hand and domestic violence. Unless you are referring to the frying pan and baseball bat? – Irony. Strangely enough the only real violence I draw experience from above is from my school days, where we used to be unmercifully leathered – usually for nothing. I remember once, the entire class got six leathers on each hand because one of us was singing out of tune. The Brothers just liked the power. It didn’t do us any harm in the long run though. there’s an RTE podcast i listened to recently, a documentary about an accordian player. he talked about how he was smacked repeatedly on each side of the head–ears boxed–by a christian brother. and how angry it made him, and how it changed his life. not for the good. you should listen to it. he talks about how it made him want to kill the priest, and what he did after that. it’s a devastating thing to listen to. the odd smack, fine. i was smacked myself as a kid. but there’s a dangerous continuum…. I do NOT agree with hitting the head under ANY circumstances [boxing completely baffles me]. I was talking about hand slapping or caning which was commonplace and I don’t think did much harm. Hitting the head is a different matter and I would have no truck with that whatsoever. I’m not surprised the chap was changed. I’d have felt like killing the brother myself, probably. This is one of the few things I’ve read recently on th’internet which actually caused me to laugh out loud. I know, Rob. We always laugh when we do it. It’s nice to share a joke with one’s partner. I’ve never lifted a finger to mini-Skinner. She’s smarter and more devious than that nipper off Family Guy. I’m afraid if I ever did, I’d come home to find the house missing and the cops looking to arrest me on trumped up treason charges. Herself has an unfair advantage over me. I’m sure she still has her da’s revolver he kept after the civil war. I have to be careful…….. I have a friend whose son came home from school very late and he said,”Where have you been?” The kid said,”Behind the barn with Mary Jane.”My friend said,”You shouldn’t be doing that, but for telling the truth, here’s a cookie.” The next day the same story. Behind the barn again. He gets another cookie for telling the truth. The third day he’s late again. “Where have you been?” “With Mary Jane”. The father grabs a frying pan and his wife screams,”John, don’t hit our boy with the frying pan. !” John says, “Hit him? Hell, I’m not going to hit him. I’m going to fry him a couple of eggs. He can’t keep up this stuff on cookies”. God, I’d hate to see you rowing over something serious, like the TV remote. I have the remote. She can have charge of the kettle. That’s the way it’s always been. Ah … sexism … where would we be without it? Possibly in the dark ages? Am loving your blog. I was never hit as a child and as a result I am a self obsessed drama queen, so bring on the strap. PS – why do americans always take everything SO seriously. Hi Irishflirtysomething. Why don’t you change your name by deed poll? It must be a bugger when writing cheques! I’ll keep up the work as long as I can [possibly until the end of the week]. And don’t blame me for Roisin. Blame Herself. She started it. And if I comment on the American sense of humour I’ll only get it in the neck again. That’s a good point though – if I wrote a humourous article about the American sense of humour, would they see the humour in it? Chip and Pin grandad, it’s the future! I used to be flirtysomething but lost my password, bloody short-term memory loss. Oh, if your wife thinks the roisin story is bad under no circumstances let her read the Indo p5. The summary is on my blog, frightening.